Work continues on restoration of “the Barracks”. Currently preparations are underway to install a wooden plank floor in the building. This flooring project, a volunteer effort by members and friends of the Cobourg Museum Foundation, will be undertaken in the fall of 2009. Funding for the flooring materials has been provided in a grant from the Province’s Trillium Foundation. In the process of preparing the building for construction of the floor it was determined that subsurface sections of the limestone walls were becoming structurally unsound due to infiltration of groundwater into the mortar. Advice from local architect J. Doubt was that the base of the walls be strengthened with concrete, and this work was completed in September with the generous assistance of labour and materials by local businesses. direct the pouring and “paddling” of the concrete, and remove the forms and bracing after the concrete had set. 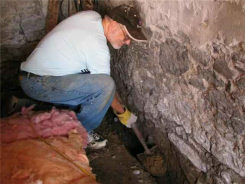 Later this year the base of the outside walls will be given the same treatment, but that should be considerably easier to accomplish.For a full story and picture of this work see Northumberland Today, Friday September 11, 2009.